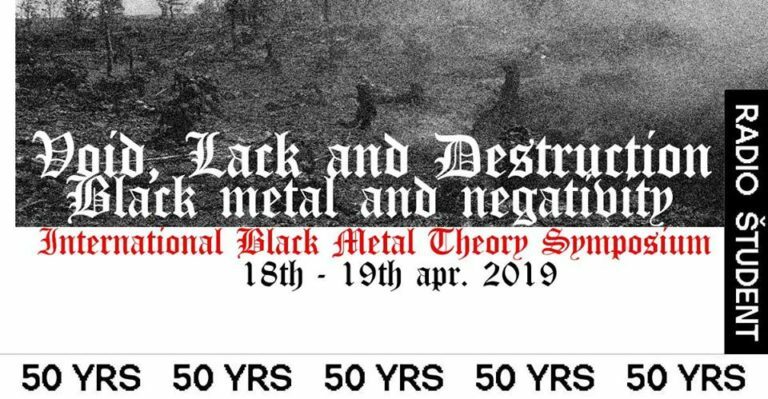 Next week will see the 2019 edition of the black metal theory symposium in Ljubljana on 18 and 19 April. As I will not be able to make it there (but you should go there! 😉 ), though I want to take the event as my occasion for a short blog post on interidsciplinarity and metal culture. Cultural-historically, black metal theory, both its journal and its symposia, is an immensely exciting phenomenon. The discourse attempts to bring together the robust spirit of black metal and metal studies. Hence, if taking its own credo seriously, it has to stay permanently pulsating, oscillating and on the move. In this way, it is hybrid. Historically, this discourse can be interpreted as a process of knowledge production, an attempt at creating knowledge practices in such a hybrid way. Metal studies’ own credo stresses interdisciplinarity. It does not want to be an independent discipline, despite the fact that many of its current academic procedures, processes and gate-keeping rules tend to aim at a direction of canonization and discipline-building. As well, this is a process of knowledge history that influences significantly how metal will be researched in the next few years. Fascinatingly, all those 50 years of metal history permanently have consisted of processes, in that the knowledge forms and practices of metal culture relied on hybridity processes. Black Sabbath used established patterns, thrash and speed metal cultures combined eclectic elements into a new genre, so did death and black metal – always, newness started from established concepts and genres of doing and knowing rock culture. Genres are results of hybridization processes, so is metal itself. The essential consequence, which arises from this, is quite a simple thought. Black metal theory tries to know metal culture using a hybrid paradigm. Metal heads and metal musicians know their music and culture in eclectically hybrid ways (despite all claims of ‘authenticity’ and ‘trueness’). This situation given, canonization, disciplinary narrowness and gate-keeping structues are metal music studies’ worst enemies. The academic field itself reflects the hybridity of the culture studied and will only work fruitfully if it will be capable of keeping its positive coherence of heterogenous approaches. This entry was posted in Artikel, Fachwissenschaftliche Artikel, Populärwissenschaftliche Artikel and tagged Black Metal theory, Cultural History, hybridity, interdisciplinarity, Metal Music Studies, peterpichlerstahl. Bookmark the permalink.